Ranveer Singh is currently shooting for his upcoming film '83 in Dharamshala and the pictures from the sets have been making fans even more eager about the film. Ranveer is cherishing the opportunity to play the role of his life as he gets to play the legendary Indian Cricketer, Kapil Dev, who was also the skipper of the iconic 1983 Indian squad that lifted the first ever World Cup for the nation. We have seen that veteran players like Kapil Dev and Mohinder Amarnath have already joined the team of actors, to help them train for the film. 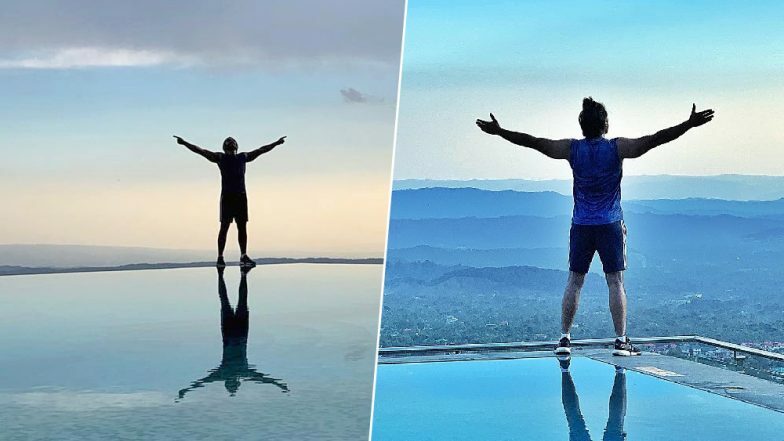 Ranveer's social media has been buzzing with updates from the film's practise sessions and now his new picture shows him standing at the edge of an infinity pool at a resort in Himachal Pradesh. The actor took to Instagram to share this picture and wrote, "Top of the world." In the picture, Ranveer is seen standing with his arms spread wide as though he is ready to take on any challenge with open arms. The actor has been riding high on the success of his last film, Gully Boy which won him a lot of praises and we completely understand why he should feel 'on the top of the world'. After Kapil Dev, 'Jimmy' Aka Mohinder Amarnath Joins Ranveer Singh's '83 Team in Dharamshala - View Pics. Yesterday, we saw Ranveer enjoying a rap session at a local Dharamshala restaurant along with his 83 team members including Punjabi singer Harrdy Sandhu. The film's casting for the winning squad has been announced and it includes actors such as Saqib Saleem, Sahil Khattar, Jatin Sarna, Ammy Virk, Adinath Kothare etc. Ranveer Singh Raps Gully Boy Songs Along With Harrdy Sandhu and Team '83 at a Dharamshala Restaurant - Watch Videos. The Kabir Khan film is expected to release next year. Apart from 83, Ranveer has also been signed on for Karan Johar's next directorial, the period drama, Takht.